Sustainability and ethics underpin everything we do. We strive to set an example for environmental leadership and corporate social responsibility, not just in catering, but in the wider business community. We were the first contract caterer to achieve the Sustainable Restaurant Association (SRA) Three Star Champion Status, known as the Michelin stars of sustainability. In 2016, for the third successive year, the SRA named us as the most sustainable contract caterer with the ‘Food Made Good’ Award. Raymond Blanc OBE, President of the SRA, presented us with the award in recognition of our continued outstanding level of sustainability. By adopting the Sustainable Restaurant Association’s (SRA) three pillars of sustainability as a framework we have created a balanced approach to achieving triple bottom line results for people, planet and proﬁt. Within these we focus our efforts on five strategic areas: sourcing, environment, society, community and responsible marketing. We publish our results, download our ‘Fruitful World’ Corporate Social Environmental Responsibility report for 2018. bartlett mitchell CSER Report 2018.
from overseas suppliers who have access to an international trade system based on justice and fairness, including Fairtrade. We have a responsible attitude to our supply chain, which means using our purchasing power to bring about positive economic, environmental and social change. Sourcing Perkee coffee from the Soppexcca co-op in Nicaragua is a good example. We’ve improved our energy efficiency, and use our ‘Free Wheeling’ initiative to reduce the number of deliveries to our kitchens. Our customers always have the option to drink tap water. Where we need to sell bottled water, it’s from a sustainable source – Thirsty Planet in Harrogate. A percentage of the profit from Thirsty Planet water funds Elephant Pumps to supply clean, safe water to thousands of people in impoverished communities in Malawi. Reduce, reuse and recycle is one of our mantras. We measure our waste and send a percentage of our food waste to anaerobic digesters. We offer customers our coffee grounds for their gardens. Achieving ISO 14001 accreditation is important to us. This environmental management framework controls our activities affecting the environment, reduces impacts and ensures legal compliance. We believe healthy eating and great tasting food go together. Our award-winning DARE programme (Delicious and Responsible Eating) encourages customers to eat at least five portions of fruit and vegetables a day, and to eat less salt, fat and sugar. We use healthier cooking methods, with less fat and oil, and prefer baking, grilling or roasting to frying. Working with organisations in our communities is a positive experience for us all. As a result we are to be part of a vibrant and healthy community, and our community benefits from the good will, time and expertise we can offer. We support industry, local, national and international charities, including Springboard (helping young, unemployed and disadvantaged people make a career in hospitality, leisure and tourism), White Lodge Centre (supporting disabled people of all ages), Macmillan World’s Biggest Coffee Morning, Sport Relief, Comic Relief and the Kotukula Primary School in the Gambia. Most importantly, we believe learning transforms lives. Our community education commitments include mentoring Year 11 students, work experience placements, apprenticeships and a graduate programme. We’ve achieved Investors in People Gold. This is the highest level of the award, given only to those who can demonstrate excellence in the way they develop and support their team. Team members have a safe, pleasant and healthy environment to work in. We are proud to be a ‘Best Company’ to work for, because our teams vote for this. Our customers receive high levels of service and great food using sustainable ingredients. We keep our promises to our clients. We have strong, ethical relationships with our suppliers. We pay them promptly and work in partnership to achieve the best results. Today’s customers are more empowered than ever, and their expectations of business behaviour are increasing all the time. We have a responsible marketing policy, based on our strong ethical values, which means customers can be sure our claims are honest and accurate. 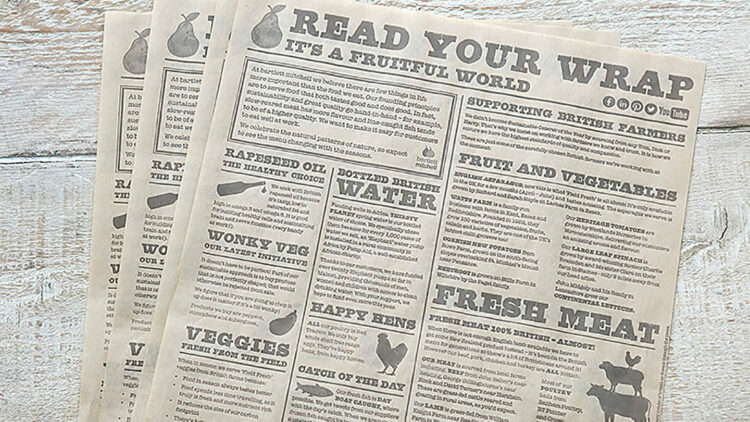 ‘Read your Wrap’, our award-winning sustainable greaseproof paper, is a great example of our approach to responsible marketing.